The New York Pizza Tour to Brooklyn and Coney Island definitely has to be on my site. However: if you fancy eating huge amounts of special, unique pizzas in all shapes and sizes, then this tour isn’t for you. Nevertheless, I would highly recommend this tour which lasts four and a half hours. 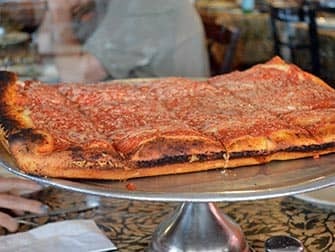 Don’t think of it as a pizza tour that happens to pass through Brooklyn and Coney Island, but rather as a Brooklyn and Coney Island tour, with really good slices of pizza as a bonus. The tour starts at Union Square, which is centrally located. From here, a bus will take you over the Manhattan Bridge and straight into Brooklyn. My guide was very enthusiastic and since the tour is organised by a family business, chances are you’ll have the same guide, or someone who is just as nice and knows just as much about Brooklyn. At the end of the tour, you’ll know exactly who lives where and have seen famous film locations firsthand. The moment the bus passes by a film location, they’ll simultaneously play the scene that was recorded there, which is great. 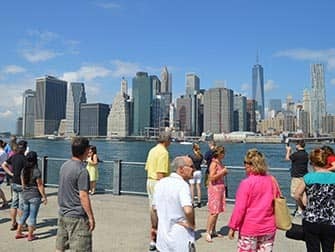 If there is time, the first stop will be at Brooklyn Bridge Park. The view you’ll have of the Manhattan skyline will take your breath away, as you can see in the photo below. 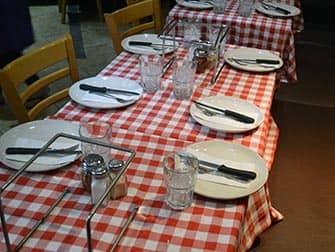 Grimaldi’s is within walking distance from Brooklyn Bridge Park. Grimaldi’s always has a long queue in front of its doors. 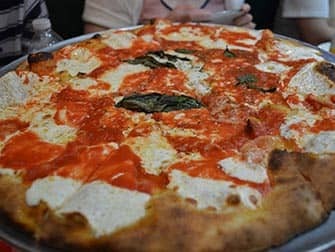 It might have something to do with the fact that it’s Michelle Obama’s favourite place, but it’s actually also widely regarded as one of the best pizza places in New York. This tour will give you the privilege of skipping the queue, so you can go straight to your set table. 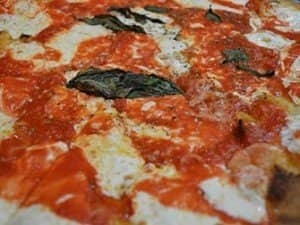 Grimaldi’s is known for its brick-oven pizzas topped with fresh mozzarella cheese and delicious sauce. Everybody will receive two slices of the regular pizza, and (non-alcoholic) drinks are included in the price too. With a full belly, you’ll then be taken on a ride through the most beautiful areas of Brooklyn. 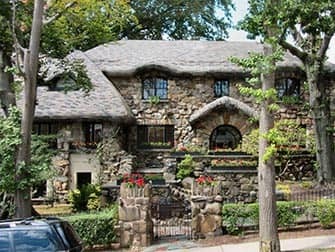 As you drive along the remarkable, detached houses, you’ll discover that the city vibes will fade away. 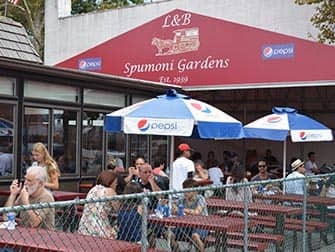 Time for the next pizza break: L&B Spumoni Gardens. This place is really and truly deep within Brooklyn: you’ll only find locals. That’s a pity, because these pizzas are definitely worth it. The pizza crusts are thicker, but the specialty here is the cheese which is hidden underneath the tomato sauce. Delicious! You’ll get two slices and a (non-alcoholic) drink here as well. Fully satisfied now, you can relax in the bus, which will take you directly to Coney Island. This is the icing on the cake if you ask me. Or rather, the pepperoni on the pizza! 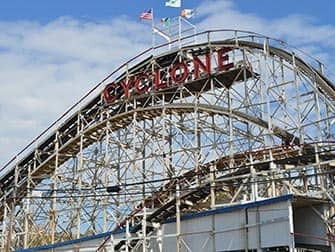 Normally it would take you at least two and a half to three hours to go to and from Coney Island. You’ll now get there fast and easy. 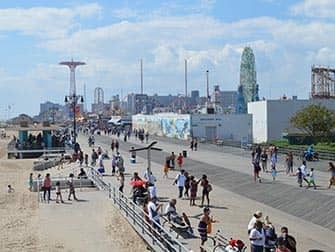 The guide will take you for a stroll over the boardwalk and show you the world famous Nathan’s Hot Dogs and Luna Park. Do you crave more, want to take another roller-coaster ride or just stay outside? You are free to end your tour at Coney Island and return on your own. Your guide will gladly explain how to get back properly. If you return by bus, then you’ll be back within half an hour at Union Square, the tour’s starting point. 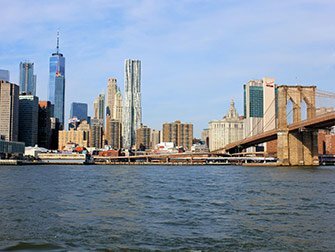 Your head will be full of images of a completely different side of New York, beautiful pictures stored on your memory card and a happy belly as well! 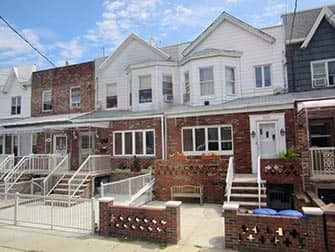 This tour might not be the cheapest, but an all-encompassing four and a half hour tour through Brooklyn like this, is definitely worth it. Even more so with the efficient visit to Coney Island and last but not least: scrumptious pizza!